If you would like to pulse your local statistics automatically towards the website, you can! The "hour" is in 24-hour format. You can configure multiple auto pulse settings. Whenever you have multiple settings configured, it will respond to the first that comes along. 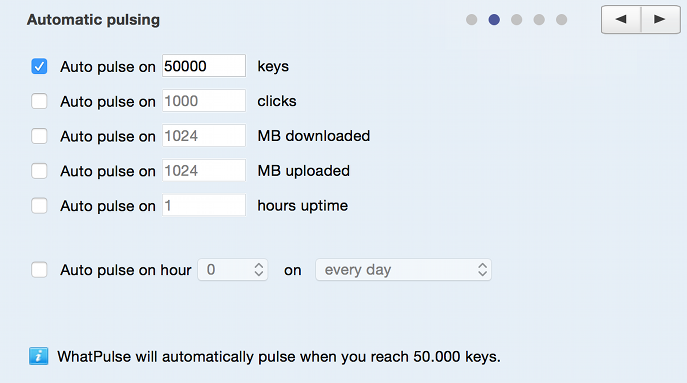 For instance, if you configure auto pulsing on 5000 keys and 5000 clicks, the client will pulse whenever you get 5000 keys and 3000 clicks or whenever you get 3000 keys and 5000 clicks; First come, first serve. What does the option "Work Offline" do?